ISW Two State: Loads an ISW two-state superposition (equal mix of ground state and first-excited state). ISW Gaussian: Loads an ISW initial Gaussian wave packet with no initial average momentum. ISW Narrow Gaussian <p>0 = 0: Loads an ISW initial Gaussian wave packet with no initial average momentum. ISW Narrow Gaussian <p>0 = 80 π/a: Loads an ISW initial Gaussian wave packet with an initial average momentum. 1. Given the default infinite square well width of a = 1.57 = π/2, what are the ground-state and first-excited-state energies? Recall that we have scaled the problem such that ħ = m = 1. 2. Since the time dependence of energy eigenstates is just, e-iEnt/ħ, how long does it take the ground state and the first-excited state to evolve in time back to their t = 0 values? In other words, with what period do these states oscillate with time? Once you have these values compare them to each other. 3. Now select the ISW Two State and set the dt to the ground state period divided by 10. The text field can accept simple mathematical operations such as /, *, pi, etc. Single step through the simulation and see if the wave function indeed has the same period as you calculated in Question 2. Now set the dt to the ground state period divided by 3 and run the simulation. Single step through the simulation and describe the the wave function at these times. Why does this occur? What odes this result mean for the period of expectation values of x, <x>? 4. Now select one of the ISW Gaussian wave packets (ISW Gaussian, ISW Narrow Gaussian <p>0 = 0, ISW Narrow Gaussian <p>0 = 80 π/a) from the drop down menu. First look at all three wave packets. Describe the similarities and differences between the packets' initial shapes. Choose one packet and set the dt to the ground state period divided by 100 and run the simulation. Describe the motion of each wave packet. Which packet initially behaves like a particle in a classical infinite square well? 5. Now set the dt to the ground state period divided by 10 and single step through the simulation. What do you notice about the wave function at these times? Now set dt to the ground state period divided by 4, then 3 and single step through the simulation. Again describe what do you notice about the wave function at these times. 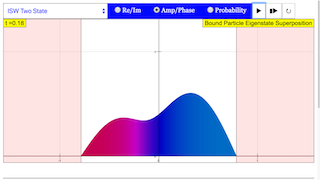 Note that unlike the infinite square well model, the simple harmonic oscillator energy eigenvalues are evenly spaced. In order to compare ISW and SHO eigenfunctions, the spring constant is chosen so that the ground state energy eigenvalues of these two systems are equal. while the others display the various plots in the sim. Toggling the display will change the type of graph shown. Control allows you to change the change in time and the width of the bounded region. Note that it won't work with the simulation is playing.